Two MSUM education majors are making noise at the Minnesota state capitol, testifying to both the House of Representatives and Senate to voice their concerns with the current Minnesota Teachers Licensure Exam basic skills test. 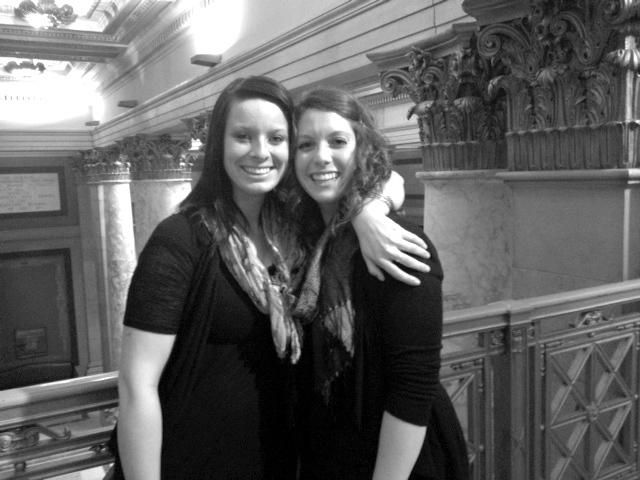 Elementary inclusive education junior Kayla Vandenheuvel and early childhood education junior Kristen Fildes visited the capitol March 7 and 8 for the Minnesota Association of Colleges for Teacher Education’s Day on The Hill. Several other education students from various colleges involved with MACTE were also in St. Paul voicing their concerns alongside Vandenheuvel and Fildes. Some of the biggest issues the two have with the test are: there is not enough time to finish the test, there is no feedback about test results, there are no study materials, it’s not testing on what it’s supposed to, the raised standards for passing and it’s expensive. “People are passing the pedagogy content test, which is the harder of the two tests, but are unable to graduate because they are unable to pass the basic skills, ” Vandenheuvel said. After spending the day talking with various senators and representatives, Vandenheuvel and Fildes found out they potentially had the opportunity to testify at a House hearing the following day while they were discussing bill H.F. 171. Both women took the floor during the hearing on March 8 to share their stories and problems with the test. Representatives about the MTLE test on March 8. Vandenheuvel and Fildes shared concerns about the MTLE with multiple educators throughout the state, which lit the fire in Rep. Barbara Yarusso, author of H.F. 171. The bill addresses concerns with the test and has proposed changes in scoring, what is actually tested on and the amount of time given to pass the test. The bill passed in the House. Vandenheuvel returned to the capitol on March 12 to testify during a Senate hearing while they discussed H.F. 171’s companion bill, S.F. 1224. The bill failed in the Senate. However, it is being looked at and amended to better fit the issues discussed during the hearings. One big change will be the change of the name from Basic Skills Test to College Level Tests. Once revised, it will be sent back to the House. 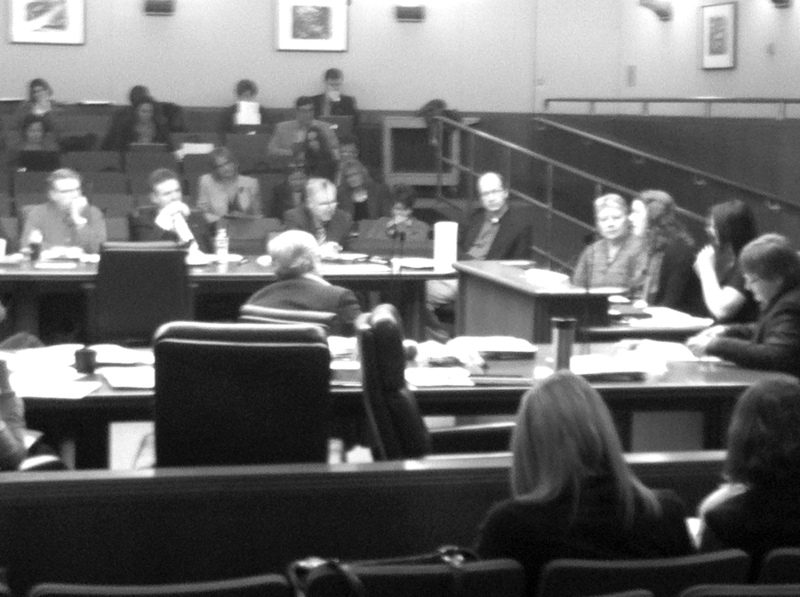 The MLTE is becoming a household issue as Vandenheuvel and the test were featured on Minneapolis news station WCCO. The test scores along with a racial bias are being looked at. According to WCCO news, 79 percent of whites pass the math portion of test with only 27 percent of blacks and 45 percent of Hispanics passing. The numbers appear biased on the reading test results as well with 79 percent of whites passing compared to 37 percent of blacks and 50 percent of Hispanics. Not only are Vandenheuvel and Fildes making themselves heard to our legislators, but they are also raising awareness on campus by creating a new society called VOICE — Voicing Our Important Concerns In Education. “We just sat down and spent like 14 hours one day and set it up and launched it,” Vandenheuvel said. The society is for Minnesota pre-service teachers to help raise awareness about the test and provide support to those that are unable to pass the test. They also have an online petition for the test re-evaluation in hopes of providing pre-service teachers with a fair and equal opportunity to pass the test. So far there are roughly 200 names on the petition. “It really puts you down and makes you feel unintelligent if you are unable to pass what is called the basic skills,” Vandenheuvel said. The society held an Action Day on March 1 where they raised awareness and made signs for the visit to the capitol. The women hope to have another Action Day soon with more people involved. Vandenveuvel and Fildes also sent out information about the society and the website to multiple schools in Minnesota that are a member of MACTE to try and generate awareness. For more information on VOICE or to sign the petition go online to minnesotavoice.wix.com/pst-voice. First of all thank you for what you are doing! I was very excited to read about your work with the legislature about the MTLE Tests. I have currently taken 8 tests, but I am struggling with the “basic skills math”. Which I might add tests me on materials I will never teach to any of my special education students K-12. I recieved a part time, special education job, right before we moved here, and have been teaching for the past year and a half, but none of it will matter if I can’t pass the basic skills math test. Sadly, many of the teachers I have spoken with at my current college say they would NOT pass the MTLE test, if they had to take it today. All of them are dynamite teachers too. It would be a great loss. Maybe the state of Minnesota can rethink this test and go back to the old Praxis test. Minnesota is one of the highest educated states already. So, why is this new test even needed, I ask you? ?